Contact Advantage Window Tinting anytime for your window tinting needs. Use the contact form below to ask us any question you may have about residential or commercial window films. We look forward to hearing from you. Advantage Window Tinting provides professional window tinting installation services to home and business owners living or working from Chicago to Naperville, IL and from Hoffman Estates to Palatine, IL, with the best Solar Control, Decorative and Safety films. We are an Illinois Corporation, have a Business License & are insured. Providing the Best Prices, Premium Window Films, Quality Installation & most important, Great Customer Service GUARANTEED! This guarantee on ever job we perform, is the reason we have our loyal repeat customers & such great referrals. Get started today! 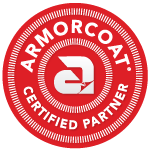 Armorcoat Safety & Security Films.